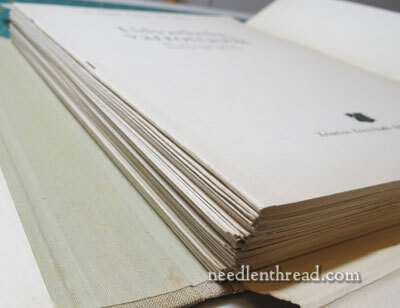 If you love embroidery and needlework books as much as I do, you’ll understand why I have to share this book find with you! This isn’t a Needlework Book Review Proper, because… well, there’s not a lot to actually review in this case (it’s mostly patterns), and because it’s not a book you’ll be able to find readily. If you do find a copy of it, though, and if you’re keen on folk embroidery, you might grab it while you can! I have had this on my “search” list for a while, and a couple months ago, I finally found a copy. 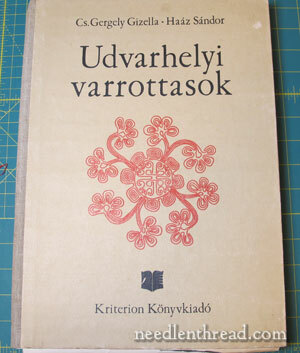 The books is called Embroidery from Udvarhelyi. Udvarhelyi was part of Transylvania, which is a region in Romania. At one time, the area was under Hungarian rule, and with the mixing of populations, we often see very similar styles in folk embroidery develop, take root, and spread to different regions. 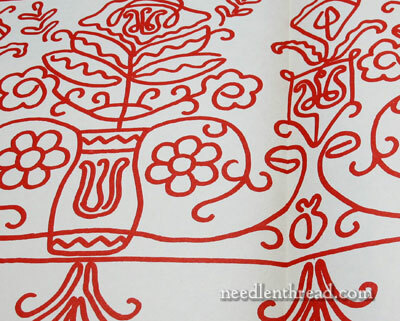 The embroidery style – in pattern, stitches, and color choices – is very much like the Hungarian folk embroidery that we see worked in red thread. 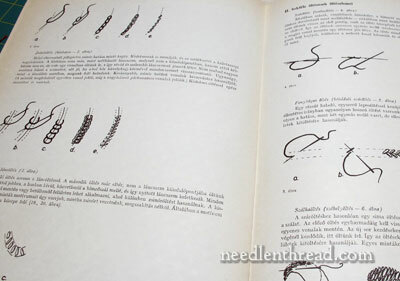 The book was published in Bucharest, Romania, in 1977, and, depending on where you find it, it is described as a book of “Hungarian embroidery patterns” or a book of “Romanian embroidery patterns.” In any case, the style of embroidery is the same. The book itself is not really a book-book, as we think of a book. 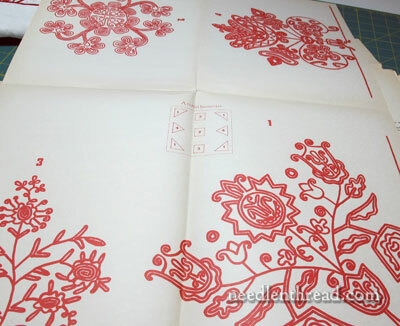 Rather, it’s a folio that holds a collection of pages – 57 fold out patterns, plus a booklet of history and instruction. The history and instructional booklet is written in Hungarian, and there are a few color photos in the booklet. There’s also a section of instruction, including diagrams for the various stitches used in this type of regional embroidery. Though the diagrams might seem somewhat rough by today’s standards, they are, in fact, very clear as far as instruction goes, and they even end with a diagram of the stitch on the back of the fabric, which is not too common in today’s stitch dictionaries. All the stitches are well known and used the world over in embroidery – chain stitch, open chain stitch, buttonhole stitch, stem stitch, various types of filling stitches from satin stitch to lattice fillings. So there aren’t really any unusual, complex, or regionally unique stitches here. The stitches used in this style of needlework are mastered quickly, they work up quickly, and they cover quickly, with a bold effect. 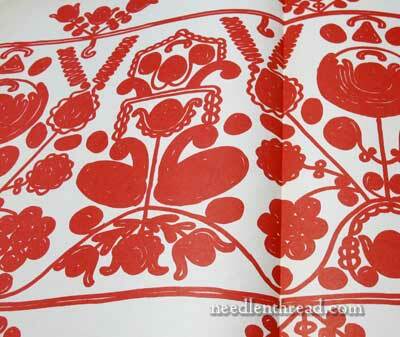 The rest of the pages in the folio fold out into tremendously bold folk embroidery patterns, and lots of ’em! Unlike line drawings that we see today in pattern books, these drawings are worked in a way that makes it clear what stitches are supposed to be used to embroider the design. 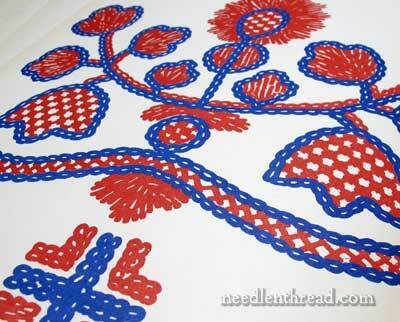 For example, in the above blue and red drawing, the lines of the pattern look like lines of chain stitch. Sometimes, the lines are smooth, straight lines, rather than chain stitch loops. Are these meant for a different stitch? It’s not really clear. Maybe any stitch? Maybe the open chain stitch, worked close into solid lines? And then there are these patterns, which I tend to think of as “blobby patterns.” The fact that the areas are meant to be filled (rather than simply outlined) is quite clear. With the pattern above, we can see that many different stitches are expected to be used in the execution of the design: chain stitch, herringbone stitch, satin stitch, lattice work fillings. 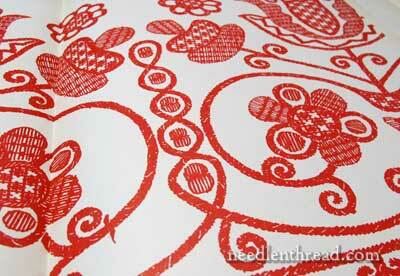 This design, too, marks out the various stitch types with the drawing itself. It’s a much more delicately drawn design than the previous one, but the idea is the same: slanted stem stitch, buttonhole stitch, lattice fillings, satin stitch – they’re all there, denoted in the pattern itself. One of my favorite patterns in the book – the lines are clear and sharp on this one, with all the stitches clearly and carefully drawn out! I was so happy with this book find! I bought it for my Christmas present, and it arrived the day before Christmas – perfect timing! 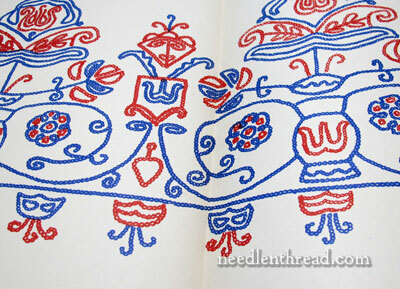 If you’re keen on this style of folk embroidery from Hungary or Romania, you might keep an eye out for this title. It apparently sells for $100+ through used book sources online, but I was able to find it for significantly less. It’s now a happy member of my stitching library, and I intend to use it as a source of inspiration for future projects. And that concludes my embroidery book purchases for 2012! There are some new books coming out in 2013 that I’m really excited about, but we’ll have to wait until next year to look at them! 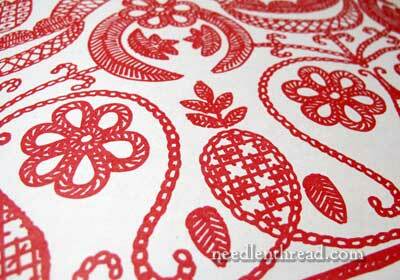 July 2, 2011 Hungarian Flower Pot Embroidery Design – Stitched! I noticed a mistake in the post – it’s either Bucharest, Romania or Budapest, Hungary. The examples you show are -very- Hungarian, with little, if any, influence from Romanian/Moldavian design. In general, Moldavian designs are counted – at least on clothing and hand linens. Thanks for showing off the book! Congratulations on this great find, and thanks for sharing it with us! I’m glad that you like folk embroidery. are more valuable than new editions. What a super find. I hope it gives you lots of pleasure. Aargh I’m so jealous… I love folk embroidery. This is so cool. I love it. You got a great addition to your library. I’m going to watch for this. I too bought myself a great embroidery book that arrived on Christmas Eve; “Colour” by Edith Anderson Feisner. It was referred to by Victoria Finlay in her more arm-chair history book about the development of painters’ colours, also called “Colour” (and a great read). Ms Feisner’s book isn’t about stitching but is excellent as it has demystified a lot for me about designing with colour. I already feel a lot more confident about using colour and my new found knowledge has helped me design a beaded and embroidered hat band for our Australian summer “down under”. Guess I am dating myself with the salutation. I have this book. I haven’t worked anything directly from it, but have used parts. I gave them all away. Anyway I have had a debate going with myself about if it is Romanian because it was published there or Hungarian because of the design influence. Unless someone from it’s publication posts, we may never know. I study it a lot. It is very good inspiration for variations on a pattern or theme. All of the subtle variations! Just yummy. I wish you a wonderful 2013. Mary, How do you come to find out that such jems even exist? I was at the movies yesterday – “The Quartet” – and in one of the very last scenes discussing the performance arrangements, the camera looks down on a beautiful red thread embroidered table runner. What a treat! Your work-in-progress will look beautiful. What a find. It looks great and will undoubtedly give you lots of pleasure although it isn’t really my style, except for the one you labelled ‘blobby’. 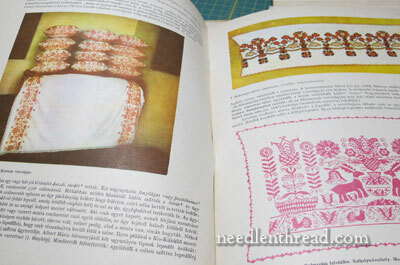 Back about the time this book was published I was living in Belgrade (then Yugoslavia) and took up embroidery. Since we had to buy almost everything by mail order, I sent for a Vogue pattern for a caftan-ish top with embroidery around the neckline. The embroidery was worked in several colours and each ‘blob’ was filled in with chain stitch, spiralling in from the outline. Even if I say so myself, it looked very good – at my second attempt, lol. I think your ‘blobby’ bits look as though they are meant to be filled with chain stitch, what do you think? 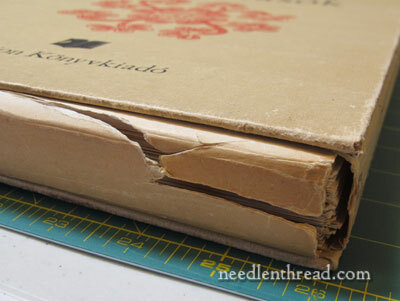 I’ve been coveting this book for quite some time… I love the chunky stitching done in the Udvarhely region. I think the filled-in areas are often done with a kind of buttonhole stitch. 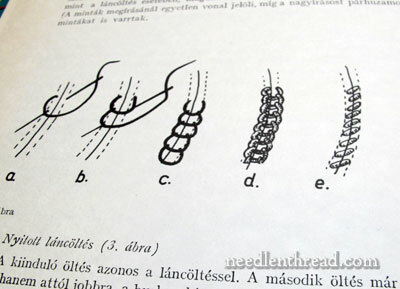 I would most definitely call this style of embroidery Hungarian though. The Udvarhely region is currently a part of Romania but it is otherwise Transsylvania, which was its own country for a couple hundred years while the rest of the former Hungarian kingdom was under Turkish rule, then it was Hungary again until 1921. Hungarians from this region (about 3 million people) are legally eligible to become dual citizens with Hungary by ethnicity. There is all kinds of history (probably only interesting to Hungarians) that has to do with specifically the Hungarians living around Udvarhely, the Szekely people. This is a fairly distinct group culturally, and they’ve developed what to the rest of Hungarians feels like a very particular design style for architecture and textiles. There are amazing carved wooden doorways they make. I will be travelling in Romania in September (hicking trip) and we will be going to Transylvania, Maramures, Bucovinia… And I hope to see embroidered garments. Your historical explanations are very interesting Kata. I will spend a few days in Bucharest before the hicking trip starts. I will look for books like the one your reviewed Mary. i am a really big fan of your page!! !the patterns are hungarian,not romanian though. It’s a hungarian book! Ungaria it’s near Romania. Sorry. I see now the previous comment. You did a great job. I see the book is written in Hungarian – the letters are different than in Romanian. I believe the stitching is for Hungarian traditional motifs, and not Romanian. Next Next post: Did You Win the Whole Set of Coton a Broder?